The parking lot at Eldora Mountain Resort was packed early today. No football on TV. And an acceptable wind. 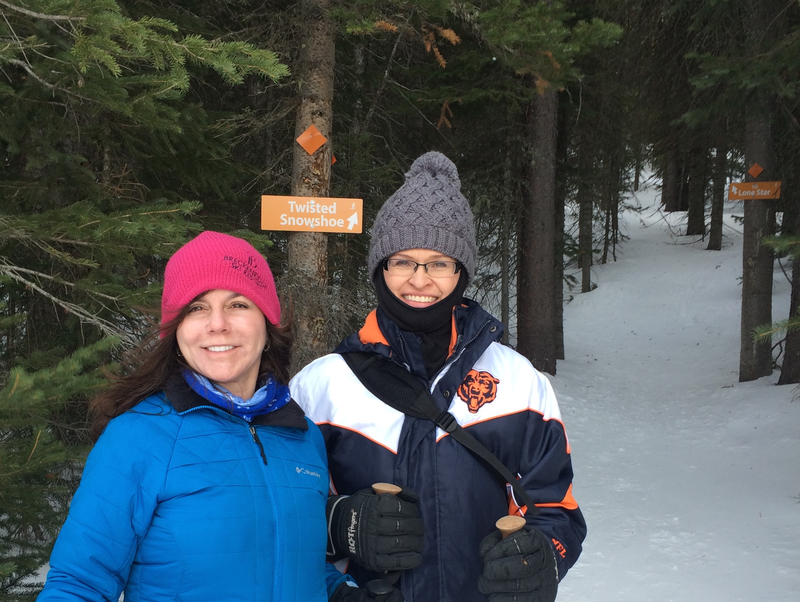 Karen and Marilee joined me this morning to snowshoe. We started counter-clockwise on the Lonestar Loop, like I have on previous outings, but turned onto the Twisted Snowshoe Trail for the shorter inside loop. 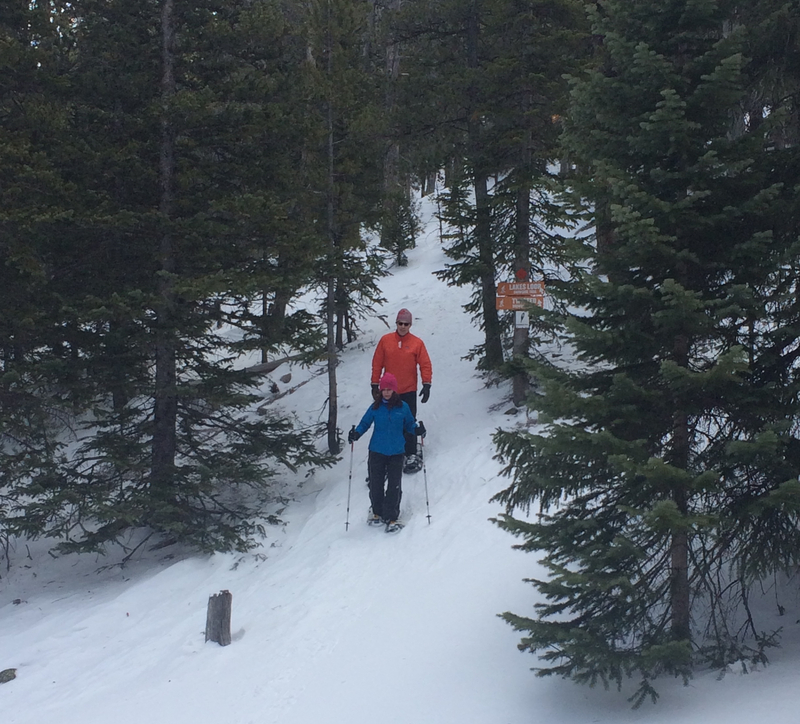 The Snowshoe Hare Trail is the middle loop and Lonestar is the longest, outside loop. Marilee took to snowshoeing like a pro. The snow isn’t difficult on these trails, no super deep powder. But the slope is fairly steep, much more so than any of the trails Karen and I did last year. We did well though despite the hills with a 1.5 mph pace for 1.5 miles – which made a one hour hike. 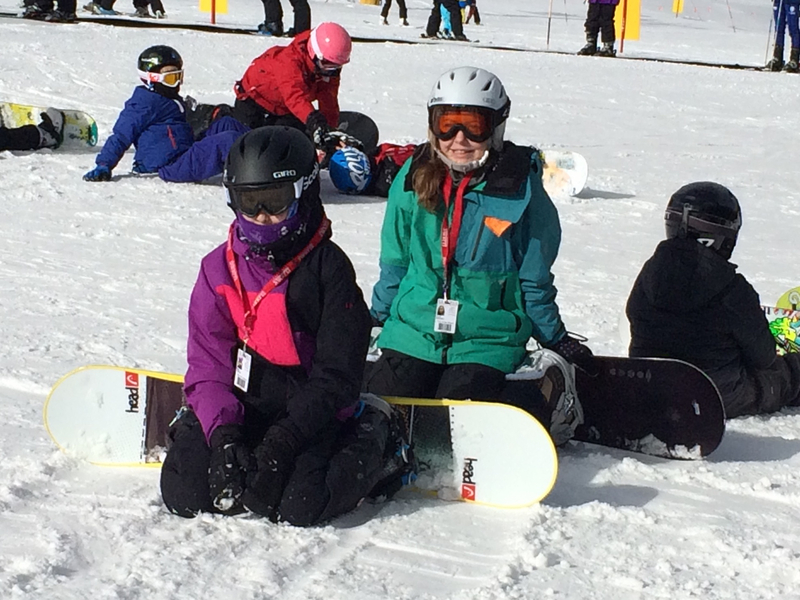 The girls enjoyed less wind for their snow boarding lessons. Shortly after lunch though, Ellie went down hard on her left shoulder. We collected her in the medical tent after the staff had recorded every ache Ellie experienced over the last several weeks. They likely learned from this to ask my daughter less open-ended questions. Who knew such extensive healthcare comes with the price of a lift ticket? Ellie is still a bit sore but nothing serious. Saturday’s twenty mile run didn’t go as well as last weekend. I was hoping to show improvement, that would help my confidence going into the Austin Marathon. Doesn’t matter, the important thing was I was able to complete the distance. Speed isn’t critical. I figure my legs were heavy from my workout the day before. There’s still a bit of ice on the LoBo Trail south of Hwy 52. There was enough clean dirt to safely navigate around the ice. In my seventh mile, just before the ice patches, I saw Jen running back toward Longmont. We gave each other a low five because we’re cool runners. On my return, I began to run over the ice simply to make the trail less pedestrian. My pace was slower than last weekend during the first half but I really slowed down at 17 miles. Kind of like how a bad marathon goes. Actually, I slowed down considerably at 17 miles last week too. But everything was under a 9 minute pace then. I ran a half minute per mile slower this Saturday. Still, running the distance is all I need to feel prepared for Austin. Three more weeks, I’ll be ready.